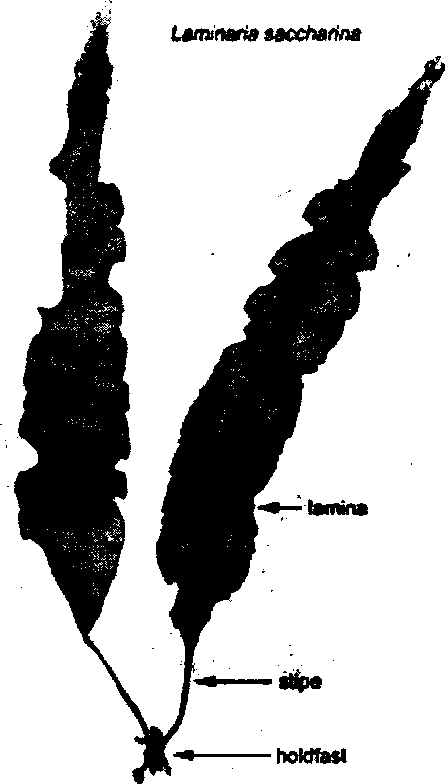 Laminaria is found along coasts of oceans. Most of the species are perennial. The plant body is sporophyte. The sporophyte is differentiated into three parts: holdfast, stipe and blade. The holdfast is a system of forked root like branches (hapetra). The stipe is always unbranched it may be cylindrical or flattened. Single blade is present at the terminating apex of stipes. It is divided into number of segments. Growth of the sporophyte occurs due to intercalary meristem. It is present at the juncture of stipe and blade. Meristematic activity increases the length of stipe continuously. But the length of mature blades rema;ns constant. Blades of most species persist for cne year. They stop growing late in the summer and begin to disintegrate after the plant discharge its zoospores in the autumn. (a) Epidermis: Epidermis is composed of one or two layers of small cubical cells. These cells contain many chromatophores. (b) Cortex: It is composed of elongated cells. These cells show variations in their sizes. The cells formed earlier in the growing seasons are larger. Those formed at the end of the season are smaller. The cortex of many species contains mucilaginous ducts. Connecting filaments: Certain cells filaments divide diagonally. It forms initial cells of the connecting filaments. Connecting filaments run across the medulla. Trumpet filaments: Some filaments show little divisions. They become long and broad near the transverse wall. These are called tumpet hypae. Trumpet hyphae are similar to sieve tubes of vascular plants. They bear numerous pores in their transverse walls. These pores have cytoplasmic strands. The protoplast of adjoining cells is connected with each other by these cytoplasmic strands. The wall of trumpet hypae also contains spiral bands of cellulose thickenings. The function of trumpet hyphae is still unknown. It is suggested that they are concerned with the conduction of material and support. Asexual reproduction takes place by zoospore formation. Zoospores are produced in cup shaped unilocular sporangia. Many sporangia form son. They are formed in summer or autumn. 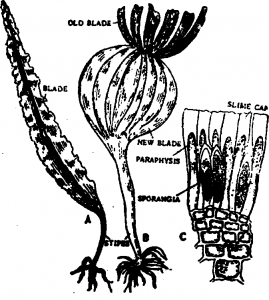 Hair like cells paraphyses is present between sporangia. Sporangia and paraphyses are epidermal in origin. Formation of zoospores: The nucleus of sporangium divides meiotically during zoospore formation. Then many mitotic divisions occur. Thus 32-64 nuclei are formed. Each nucleus is surrounded by proplast and it finally changed into biflagellate zoospore. The sporangial wall breaks and release zoospores. They swim for some time. They round up and secrete a wall. Thus embryo spore is formed. It develops germ tube. Nucleus and chromatophom moves into the apex germ tube. A transverse septa cut off the apical cell. 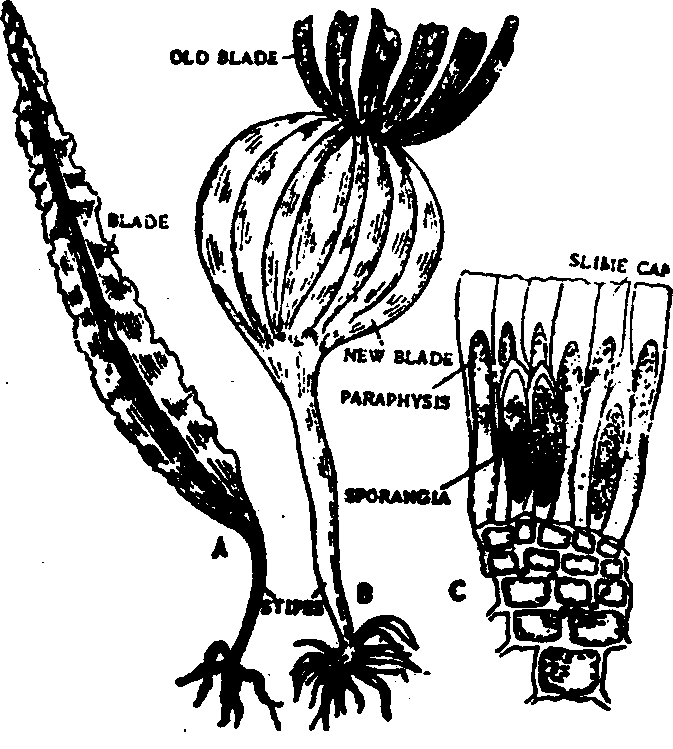 The apical cell develops into a very small filamentous gametaphyte. Sexual reproduction is oogamous. Laminaria is a dioecious plant. Antiieridia are developed on male gametophyte and oogonia are developed on female gametophyte. Antiteridia: Male gametophyte develops one or two celled literal branches. Antheridia develop on the tip of these branches. Antheridium is single celled. It is changed into single antherozoid. Antherozoid has lateral flagella. 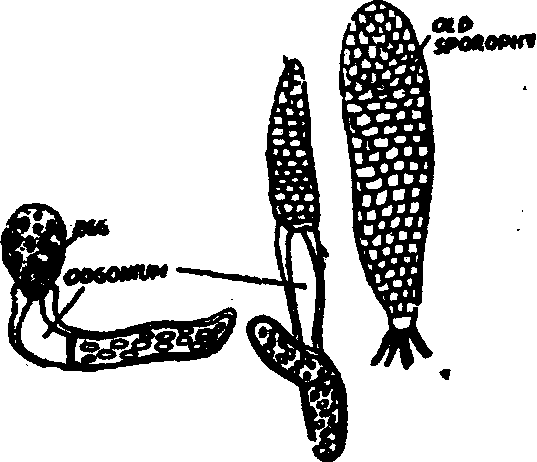 Oogonia: Oogonium is produced on small twb or three celled female gametophyte. Oogonia may be terminal or intercalary. An oogonium is longer and thicker than other cells. Its protoplast changes ,nto egg. The mature egg remained attached to the apex of oogonial wall. Germination of zygote: The zygote develops into diploid sporophyte. Many divisions occur in zygote. It forms 4 -8 cells. It is still attached to the oogonial apex. Except lower most cells, all the cells divide to form blade like shield. 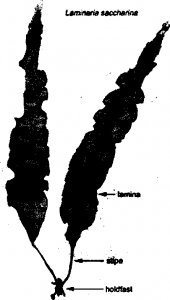 The lowermost cells elongate to form first rhizoid. This rhizoid develops several branched ihizoids. Sprophyte: It is diploid generation. Its body has three parts: hold fast, stipe and blade. It develops sporangia. 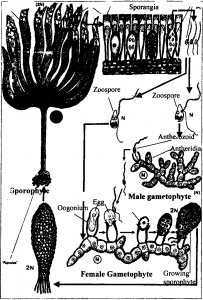 The sporangia develop spores by meiosis. Thus haploid zoospores are produced. 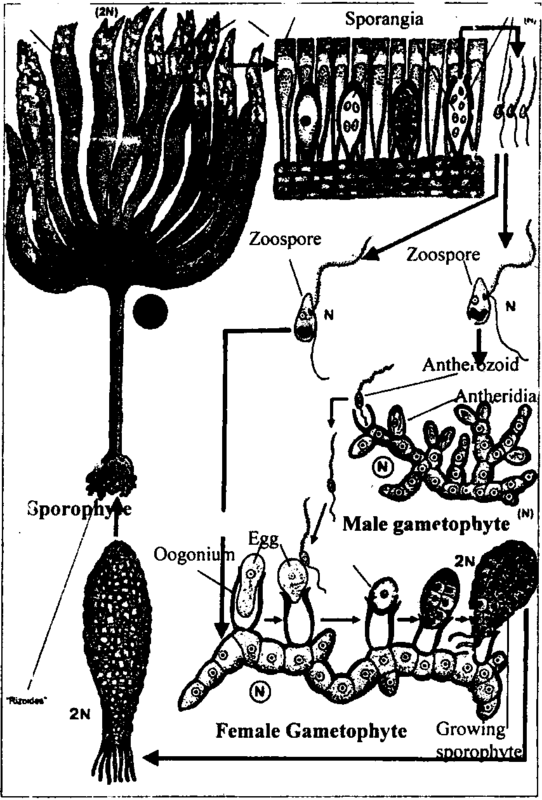 Zoospores germinate to form male and female gametophytes. Gametophyte: Gametophyte is haploid filamentous and microscopic. Antheridia are produced on male gametophyte. It produces haploid antherozoid. Oogonia develop on female plant. It produces egg. Fusion of antherozoid and egg produce diploid zygote. The zygote develops into diploid sporophyte.